The E-SAMPLER is the most feature-packed light-scatter Aerosol Monitor available. Whatever your monitoring needs, the E-sampler will provide accurate, dependable and relevant data. The E-SAMPLER is a dual technology instrument that combines the unequalled realtime measurement of light scatter with the accuracy standard of filter methods. The simple filter loading process testifies to the seamless blending of both technologies. filters can be extracted and replaced in less than one minute and filter medium can be selected based on laboratory analysis. Particulate loading on the filter does not reduce performance due to the Met One actual flow control protocol. Ambient temperature and pressure are measured and actual flow is calculated and controlled by the E-SAMPLER microprocessor independent of filter loading change. 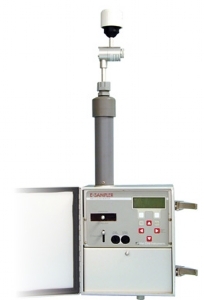 The E-SAMPLER provides realtime particulate measurement through near-forward light scattering. An internal rotary vane pump draws air at 2LPM into the sensing chamber where it passes through visible laser light. Aerosols in the air scatter light in proportion to the particulate load in the air. Scattered light is collected by precise glass optics and focused on a PIN diode. Rugged state of the art electronics measure the intensity of the focused light and output a signal to the CPU. The output is linear to concentrations greater than 65,000 µm/m3. Every E-SAMPLER is factory calibrated using polystyrene latex spheres of known index of refraction and diameter at multiple points to validate linearity. Each E-SAMPLER has two internal filters (not the 47mm analysis filter) to protect sensitive optics and prevent damage to the flow components. Both filters are accessible from the front panel. Coin slots enable these filters to be removed and checked or replaced without any tools. Filter life for both will exceed 1 year in the harshest of conditions. All E-SAMPLERS have sheath air from the internal filters that continually curtain the optics. This sheath air proteciton allows the E-SAMPLER to be used in adverse environments without performance degradation. Even in harsh conditions the E-SAMPLER will operate to specifications for 2 years without need of recalibration. The E-SAMPLER is rugged, portable and easy to use. The all aluminum enclosure is not only rugged but provides electronic stability by filtering potential RF interference. Set up is a snap with the quick connect system which works with the EX-905 Tripod. For other mounting applications, holes are provided to fasten to any structure. Simply turning the monitor on with start a sample using the most recent parameters. The unit will continue to operate until user intervention or battery failure. Auto-Zero and Auto-Span ensure that the data collected will be of the highest quality. Both Zero and Span can be operated manually or individually programmed at avarying time bases (15 minutes to 24 hours). The E-SAMPLER can also be configured for start/stop times, recording periods, averaging time and other parameters. Optional MicroMet Plus is a complete communications, data collection and data reporting tool. This software supports modem, radio, direct connection and generates summary reports as well as recordings and charts. Comet software is included which provides easy to use terminal access to E-Sampler data.